History: Euro Direct België was formed under the name of Sky Freighters on November 15 1991 as a joint venture between Federal Express (Fedex) and Sky-Service for operating intra European parcel services from Brussels on behalf of Fedex. Three F27s were used, with options on three more, but during May 1992 the American company decided to drop its European network and the Fokkers were ferried to the USA. Sky Freighters remained dormant until a pax BAe 31 was leased from Eurodirect (UK) in July 1994. 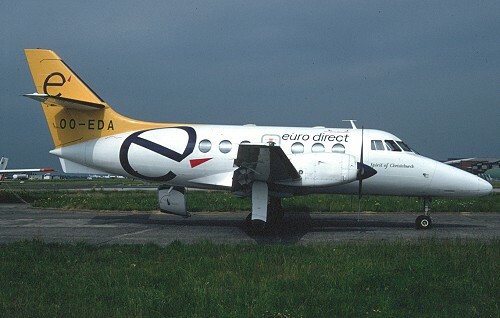 At the end of that year a scheduled pax service between Kortrijk and Stansted-Humberside was flown under name of Euro Direct België (new name of Sky Freighters adopted on November 30 1994), but was ended in February 1995 when Eurodirect (UK) went into liquidation. A scheduled service from Brussels to Humberside was started on April 3 1995. The company changed name to Euro Direct on May 31 1995, and from January 8 1996 on the scheduled service was operated on behalf of Sabena receiving their colors. On September 13 1996 this service was stopped, the BAe 31 was returned a month later, thus ending flying operations of Euro Direct and they were declared bankrupt on December 28 1998.